These tools really speed up the process as they automatically generate hundreds of ideas for you. The process is quite easy, you enter a root keyword and the domain name suggestion tool usually combines the word with adjectives or a list of common words. 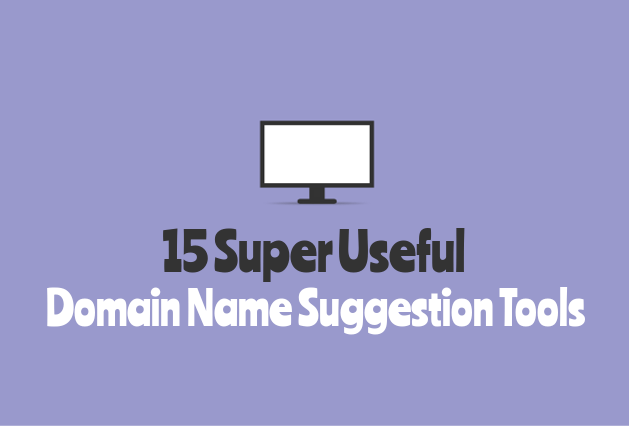 I tried a lot of domain name suggestion tools but these are some of the best ones that are easy to use and give you a wide range of ideas for your next website. NameTumbler is an excellent domain name suggestion tool and my personal favorite because it is a complete solution to my needs. I personally like this one because it’s easy to use. Just insert your keyword and choose the category for which it should combine the word with. In no time you will have a huge list of ideas to choose from. The only thing that it’s missing from this awesome tool is an option to check the availability of the generated ideas. I usually use instantdomainsearch for this and it works great. This one is a little different because it doesn’t just combine a keyword with other words, it usually suggests some cool ideas. You also have the option to register them and it conveniently shows if they are either available or taken. So, there’s no need to use other tools to check the availability. Nameboy Is a domain name suggestion tool that lets you insert a primary keyword and a secondary one, after which, it will generate a few ideas based on those keywords. It will also show you if they are available or taken, by displaying a green or red color. Is another personal favorite of mine, as it has everything you will ever need to come up with a domain name. Domainhole includes a name spinner were you can combine your keyword with a huge list of words/suffixes/prefixes and more. It also includes a name generator, which is quite cool as it generates random catchy ideas. All you have to do is to choose the length and the tld and the tool will automatically generate a list for you. It also displays the availability and offers registration at some of the most popular registrars, such as: Godaddy, Namecheap,1 & 1, and more. Leandomainsearch is by far the simplest domain name suggestion tool to use. All you have to do is to insert a word and Leandomainsearch will automatically suggest a wide range of ideas for you. As usual, you can see if the domains are either available or taken and you can even register them. This is another great generator which combines your chosen keyword with a list of popular adjectives, nouns, and verbs. You can also easily see the availability of each one and you can even register them. Dotomator lets you insert more than one word at a time, which is very convenient as you don’t have to go trough the tool again using another keyword. It will also show you if the domains are available and displays registration options. Panabee is quite easy and fun to use. Easy because you just have to insert a keyword and hit the “search button” and fun because of the beautiful displayed ideas. It will automatically generate a list for you and show which names are available or taken. Namemesh is another easy to use domain name suggestion tool because all you have to do is to enter a word and a list of ideas will be automatically generated for you. The cool thing about Namemesh is that it displays the generated list in categories such as: fun, short, SEO, and more. This way you can easily go through them. Namemesh also displays registration options and shows the availability. Namestall offers much more than a simple domain suggestion tool, it also has a generator tool, a brand name generator, and even a tool that generates domains based on high paying keywords. Dynadot is quite easy to use, pick a word enter it and hit suggest. This tool will generate a few ideas for you and will automatically show if they are available or taken. Wordoid is quite a powerful tool for finding great domain names, as it has some interesting features. What I like most about Wordoid is that you can choose a language or more to combine English words with. BigRock not only offers domain registrations but it also has a cool suggestion tool, among other things. The tool is very easy to use and quite useful. Randomainer doesn’t have much features but still makes this list of useful domain name suggestion tools due to its ease of use. Domainscope has a few interesting features, such as the ability to use synonyms, location words, and more. This tool also has a “keyword lab” where you can experiment different related words to your initial keyword. The hardest part was to come up with a cool name. Now, it comes the easy part: registering it. But where? Namecheap is my favorite registrar at the moment, as it offers cheap domain names, great support, and free 1 year WHOIS privacy for any new registration. Godaddy is another registrar that offers cheap registrations and lots of discounts and offers. I know this is the best place to brag about myself...but I don't care about that. I'm Denisa and this is My Blogging Thing :-). Follow me on Google+ to get the latest updates or just to say hi. I have used them and they are awesome to get a perfect name for our business. Because of these domain name suggestion tools I got a very nice domain name. My domain name is short and brandable but its not easy to spell but I know we have to compromise somewhere. How did you got your domain name and did you use any one of these suggestion tools? Keep up the good work Denisa. I’m using a few domain name suggestion tools to come up with great domain names. These are really very useful tools to find domain name, i used leandomainsearch for my domain search which gave me a huge list of options to choose best domain name for my first website.